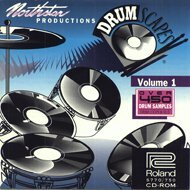 Drumscapes S770 is a CD-ROM for the Roland S770/750 and compatible devices, which incorporates 61 volumes of acoustic drum performance loops and fills along with the individual drum samples from the Drumscapes Audio CD. Drums from Mark Schulman (Stevie Nicks, Foreigner, Richard Marx, Jeff Lorber) and Brian David Willis (Quarterflash). Plus, we've thrown in about a hundred extra ethnic, funk and rap percussion samples.